In July of this year, my wife, Ann and I, and 11 other family members, returned to one of our favorite vacation spots – Mt. Hood, Oregon. We enjoyed a week of terrific weather at a privately-owned lodge located about 3,000 feet up on the north side of the mountain. The area is called “Cooper Spur” by the locals. How nice was the weather? Pleasant enough that during the day that when you went on a hike, short pants and a T-shirt would do you fine. At night, you needed a light blanket for sleeping. Mt. Hood is less than an hour by car from the Columbia River and the town of Hood River. 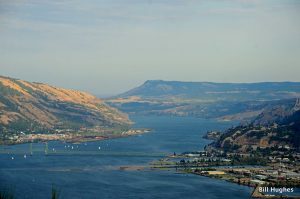 This area, where the river separates Oregon from Washington State, is known as the Columbia River Gorge. There’s a bridge spanning the river at Hood River and the pristine Hood River basin is popular with windsurfers. Driving towards Mt. Hood out of Hood River, we pass through an area full of beautiful vineyards/orchards. You will find a wide array of crops: such as grapes, pears, apples, cherries and berries. When you wake up in the morning at our spot on the mountain, you can walk outside the back door, and, there it is: Mt. Hood – in all its glory. 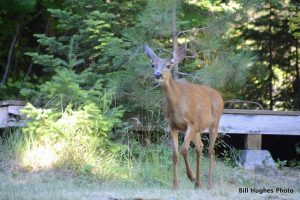 If it’s your lucky photo day, you can catch a deer or two meandering around between the trees or a rabbit in the backyard. Claiming the title of Oregon “highest mountain,” it’s located within a huge forest area of over 1.7 million acres k/a “The Mount Hood National Forest.” It’s snow-peaked and has 11 glaciers on it. 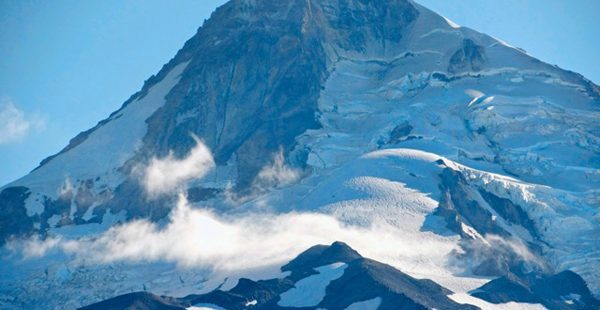 Glaciologists from Portland State U. say, however, that the glaciers on Mt. Hood have lost significant amounts “of their volume since 1982.” It’s called “global warming” folks. I recommend a side trip to Timberline. It was built during The Great Depression by the Works Progress Administration (WPA). Lots of interesting carved art and paneling can be found inside. It’s also a working hotel with first class accommodations and a nice dining room. If you have a bite to eat, you can watch the ski lift doing its thing. The lodge was dedicated on September 28, 1937, by President Franklin D. Roosevelt. Its elevation is put at 5,960 feet. The valley below the mountain on its northern side is full of beautiful vineyards/orchards. You will find a wide array of crops: such as grapes, pears, apples, cherries and berries. Early on our vacation, we stopped at a berry vineyard and within an hour or so, we had picked over 50 pounds of delicious blueberries. Do you know what that meant? It meant that we had a terrific, homemade, blueberry pie that night! Plus, plenty of berries to add to our cereal during the rest of the week. You can get further up the mountain using secondary roads. A bumpy forty-five-minute car ride from where we stayed brings you to Cloud Cap, at around 5,850 feet. Once an Inn was located there, but it’s now closed. We dropped off five members of our group there. There’s a trail nearby that takes hikers back down the mountain to Cooper Spur – about 14 miles. They made lots of noise when they sighted a bear and a cub on the way down. They were able to complete that difficult hike – some of it across snowfields – in just under nine hours. There were easier hikes to take, too. The one that I particularly like goes around Trillium Lake. It is a easy walk, with a lovely view on a clear day of Mt. Hood. The lake is popular, too, for fishing, photography and swimming. Parts of the lake border on the legendary “Oregon Trail,” made famous by Lewis & Clark. 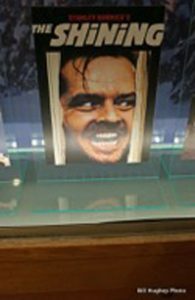 There’s plenty more to see and like about Mt. Hood. A visit to Hood River is a must, plus check out across the river on the Washington side, the town of White Salmon. Then, only a short car ride away in the Gorge area on the Oregon side, you will find the picturesque waterfalls of Multnomah, Horsetail, Bridal Veil and Punch Bowl. There is a plenty of camping sites, too, in the area. 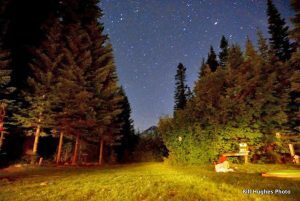 Finally, back on the mountain, at night, don’t miss magnificent star gazing with mighty Hood in the background. Indeed, from whatever perspective you view it, Mt. Hood, Oregon, and environs, is a national treasure.